The former Noble, soon to become Whitechapel. Yelp photo by Kevin Y.
Martin Cate, owner of Smuggler’s Cove, has teamed up with bartender Alex Smith and managing partner John Park of Novela, and taken over the former Noble on Polk Street. Their new project is called ~WHITECHAPEL~, after the rough and infamous neighborhood in East London. Cate says that with this project he “aims to do for gin what Smuggler’s Cove has done for rum” with a cocktail menu that shows the spirit’s range and rich history, along with the most comprehensive selection of gin and genever in North America. There will be small-batch gins from around the world, including an exclusive private label from local Distillery 209. 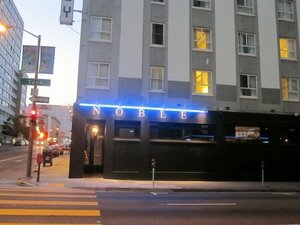 For those wishing to get serious about sampling the spirits, you can join their gin club, the Polk Street Irregulars, for special tastings and titles. As for the space, it takes its inspiration from the London underground and the industrial components of distilling, with a Victorian twist. Of course, if Smuggler’s Cove is any indication, you can expect a full commitment to the aesthetic, along with high production values. There will also be food from chef Caleb Jones (20 Spot, Bin 38, Michael Mina), with inspiration coming from Dutch and British cuisine (where genever and gin originated), and a late-night menu. The plan is to open in early winter of 2015. 600 Polk St. at Turk.